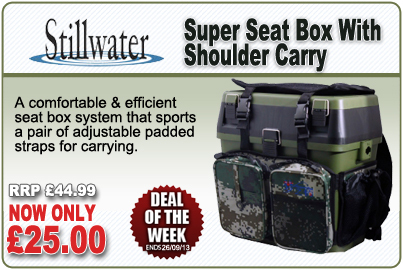 Deal of the Week is the Stillwater Super Seat Box with Shoulder Carry - RRP £44.99, now only £25.00! The Stillwater Super Seat Box with Shoulder Carry features adjustable padded straps for comfort and convenient carrying. It also comes with a large zippered front pocket and 2 additional mesh pockets with drawstring closure on the sides. It also features a seat cushion, fixed to the lid for additional comfort during those longer sessions.